Fellbarrow is the northernmost of the Loweswater fells, and sits at the northern end of the block of high ground that sits to the north of that lake. This is one of those fells that sits on the edge of the district, so the views differ quite dramatically in each direction - to the north and west we see the Cumbrian plain, the Irish Sea and the Solway Firth, with Scotland sometimes seen in the distance. To the south and east are classic Lakeland views, with the central fells seen above the Buttermere area to the south (although the rest of the Loweswater fells block the valley views), while to the east we look across the Vale of Lorton towards Whinlatter and the Grasmoor range. Fellbarrow itself is a fairly uninteresting fell - a smooth grassy hill, with some rather wet areas (the approach from the south-west is rather bad in this respect). This area is notable for the number of intact fences that cross it, and that block what would otherwise be a rather nice area to wander across. Fellbarrow is an easy grassy fell, and can be climbed from just about any direction. These fells are unusual in that they have intact fences, so the main limit are the gates and stiles. Our circuit of the Loweswater Fells from the lake visits Fellbarrow early in the walk. Fellbarrow is essentially a grassy lump, with a smooth and rather featureless summit. The main item of interest is the trig point, and a fence than runs north-south across the top of the fell. These fences are the only real barrier to the walker in this area and routes are restricted by the availability of stiles. Mosser Beck rises to the south of Fellbarrow, flows west and then curves around to the north then to the east, so forms the southern, western and northern boundaries of the fell. It is renamed as Sandy Beck on its eastern journey. To the south-east Meregill Beck runs east into the River Cocker, which forms the eastern boundary. 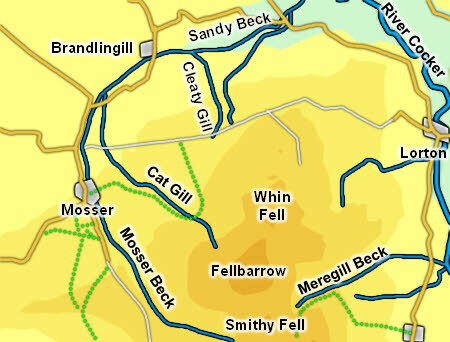 A number of becks rise on the fell, with Cat Gill starting near the summit and running north-west into Mosser Beck and Cleaty Gill which runs north into Sandy Beck.